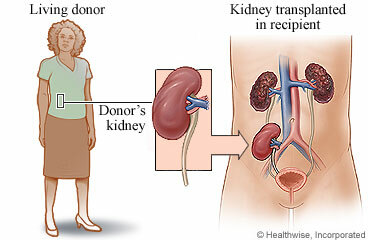 A kidney transplant is surgery to give you a healthy kidney from another person. The new kidney may come from someone you know. Or it may come from a stranger or a person who has died. To do the surgery, the doctor makes a cut in your lower belly. This cut is called an incision. The doctor places the donated kidney in your lower belly. Your own kidneys are not taken out unless they are causing problems. The doctor then connects the blood vessels of the new kidney to your blood vessels. He or she also connects the ureter of the new kidney to your bladder. (A ureter is the tube that carries urine from the kidney to the bladder.) Then the doctor closes the incision with stitches or staples. The incision will leave a scar that will fade with time. You need only one healthy kidney to live. The new kidney can do the work that your own kidneys cannot. It will remove waste from your blood. And it will balance your body's fluids and chemicals. Your new kidney may start to work very soon after surgery. Or it may not start to work well for a few weeks. If your kidney does not start to work right away, you will need to have dialysis until the new kidney is able to take over. You will probably spend 5 to 10 days in the hospital. The doctor will remove the stitches or staples about 1 to 3 weeks after surgery. Most people need to take about 4 weeks off from work. But it depends on the type of work you do and how you feel. You may get an epidural catheter. This is a tiny tube that delivers pain medicine directly into the area in your back around your spinal cord. It will prevent pain after surgery. The surgery will take about 1½ to 3 hours. You may have a tube coming out of your belly to drain fluids for a few days. You may have a thin, plastic tube in your nose that goes down the back of your throat into your stomach to drain stomach juices. It is usually removed within a few days after surgery. Enter S215 in the search box to learn more about "Kidney Transplant: Before Your Surgery".